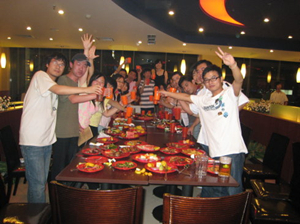 In China, college students will gather together and have a last meal before graduating, while employees will invite colleagues to eat before leaving the company. This meal is called “散伙饭”, signifying the end of one stage and the beginning of a new stage in a person's life. Wǒmen bān zhǔnbèi xià zhōuwǔ chī sànhuǒfàn. Our class is going to have a farewell meal next Friday. Wǒ xià ge yuè yào qù xīn gōngsī le, míngtiān qǐng nǐmen chī ge sànhuǒfàn ba. I am going to a new company next month, and I want to invite you to a farewell meal tomorrow.